Since 1990, we have used a mothership in Belize over sixty times as our base of operations to fish the inshore (inside the barrier reef) waters off the coast of Belize. We have utilized all the available motherships from the luxurious to the crusty and rustic options. The great appeal of a mothership trip can be summed up in three short phrases: fishing options and flexibility; you are in control; a personal experience. 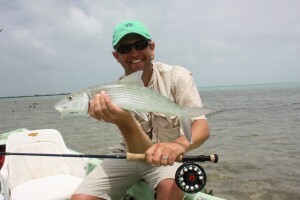 sight cast to bonefish on shallow flats. 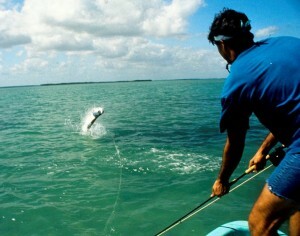 be poled over white sand and turtle grass flats sight fishing tarpon and permit. 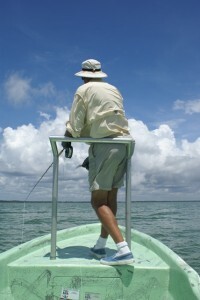 blind cast in channels for 50 – 100 pound tarpon. 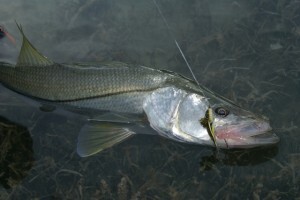 fish the mangrove edges for snook, baby tarpon and snappers. The proximity of these varied fishing opportunities is such that, if it was your desire, you could fish all the above in one morning without a boat run of over ten minutes. 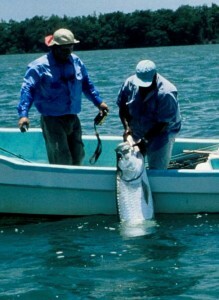 This is an example of the variety available in some areas of Belize. 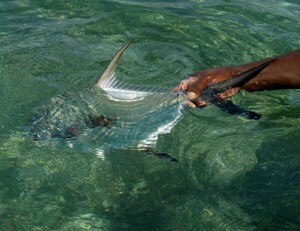 Tarpon fishing in Belize, at its best, doesn’t get any better anywhere in the world. At its worst, it’s still can be as good as anywhere else. This is especially true when you consider the comparison to the crowded tarpon flats of Florida. 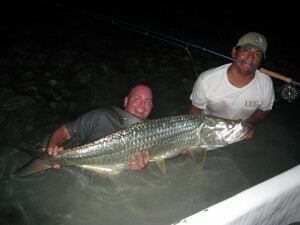 We have fished entire weeks in some areas of Belize from a mothership and not encountered another sport fisherman. 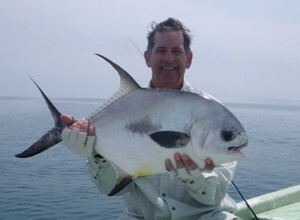 The finest permit fishing on the globe is available on the shallow flats inside the Belize barrier reef. There are many areas in Belize where permit can be found, but for numbers of fish, you can’t top the central coast of Belize. Fishermen who focus primarily on permit have had double-digit trips utilizing the opportunity to change locations every day or two, moving from flat to flat. 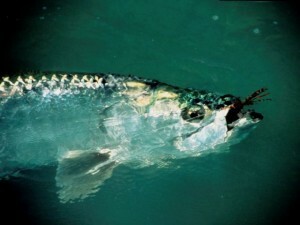 Bonefish, snook, baby tarpon, ‘cuda, jacks, snappers, etc. – they’re all here. When conditions are right, it’s your choice what you pursue and where you want to pursue them. 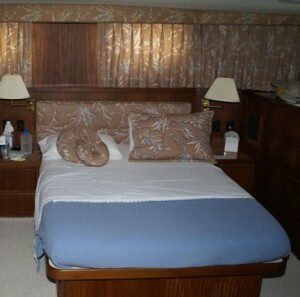 Privacy on board the Rising Tide is not a concern because of the cabin layout and the understanding of your crew. 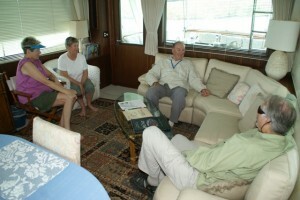 The crew has many years experience with live-aboard charters and understands the importance of privacy for their clients. They have a way of disappearing quietly that reflects their understanding. Each air-conditioned cabin is private and has it’s own shower, toilet, and sink. The dress is as casual as you could possibly imagine. There is no one on board to dress to impress except your own personal party. As long as you have a few light long sleeve shirts, pants (light pants with zip-off legs are perfect), and a wide brimmed hat to protect yourself from long hours on the water, you could get by with shorts/swimsuit and a few t-shirts if your choice was ultra casual. One light sweater is a good idea for winter trips, but it may not get any use. From native fruits and seafood to fresh baked breads and desserts, the food is always ample and appetizing. 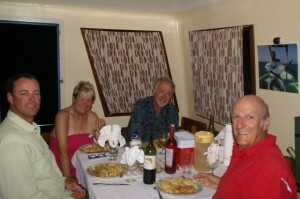 The cuisine is continental with some traditional Belizean dishes. Purified water is i n good supply along with a selection of soft drinks and local Belikan Beer. You can ask to stop at Brody’s grocery store (5 minutes from the airport) on your way to the boat and buy any wine or special beverages you may prefer. There is a selection (not as complete as a U.S. supermarket) of wines, soft drinks, and liquor at Brody’s. The rising Tide has a parlor with a DVD player, VCR, stereo (CD’s), and large table for card games, tying flies, or sunset cocktail hours. Where you anchor (for instance, if you wanted to spend some time at theTurneffe Islands, that could be added to the sc hedule). 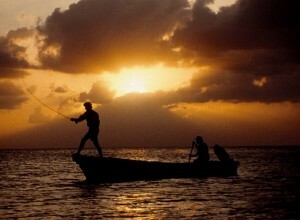 The boat schedule (do you want to look for rolling tarpon at the crack of dawn or sleep in and start the day slowly – breakfast will be prepared around your fishing schedule). The typical schedule is a three shift fishing day. What fish do you want to focus on (some areas have greater concentrations of certain species than others)? A mothership allows you to fish a very productive time in the tropics, the hour before and after dark. Do you want dinner early or late? Your air-conditioned cabin can provide a welcome area for a short break after lunch. Do you want to combine some snorkeling? (If so, it’s best to bring your own equipment sized for you). Your captain will set the schedule and itinerary to meet your goals. Of course, he will make decisions with safety as a first consideration, and there are times when weather can limit options. One of our family’s primary concerns on our first trip was that two of us get seasick very easily. We found this is not a concern as your trip is inside the second largest barrier reef in the world. 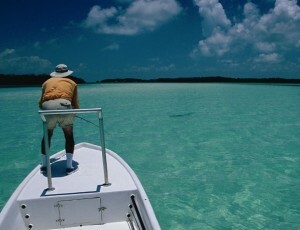 The waters are sheltered and your anchorages are always in protected areas. The only time open ocean is encountered is if you choose to make the run to the Turneffe Islands. That run requires crossing open water outside the reef. The Rising Tide (at left) hosts a maximum of 6 clients. 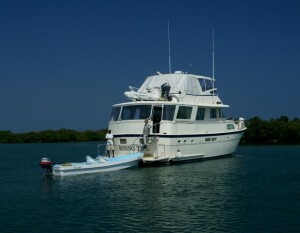 Your price includes virtually everything except personal beverages, tips, and fishing equipment. A supply of purified water, soft drinks, and native Belikan Beer is on board. Prices listed below are for the standard seven night trip. A trip for three or four would include a crew of three. The captain and mate would serve as your two guides and the cook/steward would take care of the culinary and housekeeping needs. Two flats skiffs with 40HP outboards would be towed and used for your daily excursions. The charter price for a party of five or six would include three guides; party of two would include one guide. Note: for the dedicated permit trip heading south from Belize City, there is a $1,200 fuel surcharge. “Hinckley Crab” fly: this special crab pattern, tied especially for the permit flats of Belize, is now available direct from Captain Dean for $8 each. LEANING POSTS: The skiffs are equipped with leaning posts (above right). The posts help provide balance and take the weight off your legs and feet. LOGISTICS: You are met at the Belize City International Airport and, within twenty minutes, you’ll be on board your mothership. Flight times from the U.S. are approximately 2 – 2.5 hours from Dallas, Houston, and Miami.